Posted in Articles on March 27th, 2005. To understand the enduring nature of Gene Vincent’s appeal in Europe requires a knowledge of the milieu into which he burst into prominence in 1959. Europe in the 1950s was a dreary place, the many afflictions of the Second World War lingered on. Popular culture had undergone little change over the previous two decades. Music played on radio was largely dull popular songs or middle-brow classical music. TV was by no means ubiquitous, and there were just two channels in Britain, one with inane adverts, the other without and very staid. Fashion was something the rich could indulge in. The concept of the Teenager was something alien where most young people looked pretty much like their parents and had many of the same aspirations. What would you desire after the holocaust? A quiet and safe life. This cosy pattern, however, began to erode with various incursions from the States. There’s a whole book waiting to be written about about the cultural revolution wrought by the introduction and promulgation of jeans in Europe. Here was a garment that young people could actually afford (in 1960, my employment as a Pharmaceutical Apprentice paid $4 a week!). It had the added appeal that it was casual, something one’s parents disapproved of (one was supposed to dress up smartly to go out on Saturday night), and was not worn by them. Then there were strange films suddenly bringing awareness of a youth culture unlike anything one could dream of. Young people with their own cars! AND, there was this (what we thought to be) NEW MUSIC. Looking back at the old footage, it is rather difficult to see what Bill Haley and His Comets had going for them, yet they created a sensation when they came to Europe. Suddenly it seemed, the floodgates opened. You could actually buy records like these! The good old BBC didn’t play them, but your friends did, and so did a radio station broadcasting in English to Europe from Luxembourg, of all places. Rock ‘n’ roll! We had never heard anything like it. It was exciting, incomprehensible, and our parents at best tolerated it. Whilst tapping your feet, you could firstly try and figure out what the words were, and then spend a somewhat longer time attempting to decipher them into something vaguely capable of assimilation. So, by December 1959, we had progressed to some knowledge about teenage rebellion and so forth. We had seen and been smitten by James Dean, we had goggled at Little Richard in The Girl Can’t Help It, and we had our collections of 78s and these new 45rpm records you had to have a special player for. You might even know someone who owned a long player. There had even been the odd TV performance by Buddy Holly and The Crickets, and Charlie Gracie. But don’t get me wrong, there was still a LOT of puerile pop music about on radio and TV, and record. Another development of youth culture (we now knew about this stuff), was a division that happened amongst young people themselves. The original guys who locked into rock were the Teds, with their characteristic drape jackets, drainpipe trousers, and crepe soled shoes. As financial straits eased, and Hire Purchase schemes (dubbed the Never Never in the UK) became available, young people began to obtain their own transport. We’re not talking Chuck Berrymobiles here, we’re talking British motorcycles (then the finest in the world). And, of course, following on from the motorcycle racing field where leathers were compulsory for safety reasons, a whole new fashion for black leather was born. Not many of us could afford the trousers, but the black leather jacket became something other than a practical motorcycling garment. And the wearers became Rockers. They were a subculture among young people, but an enduring one. Now, place yourself amongst your family on an early Saturday evening before you hit the town pub with your mates, tuning in to a youth oriented TV show produced by Jack Good called Boy Meets Girls . You’ve read in the music papers that an American singer who had a hit a few years back is going to appear. That’s ALL you know, except you remember a somewhat wild guy in strange clothes in that Girl Can’t Help It film, The opening titles flash up in complete silence, the screen goes black, the words GENE VINCENT appear bottom left, a side spotlight hits a face in extreme close-up, and a guitar starts playing the intro to Baby Blue. As the apparition starts to sing in his now famously unique voice, the camera pulls back to reveal he is crouching over a microphone stand, clad in black leather from head to toe. I can tell you, that moment changed people’s lives. I can still clearly remember the gobsmacked discussion of this event later. And we were hooked. What other possibility was there than to go to as many concerts as possible? The money would have to be found. 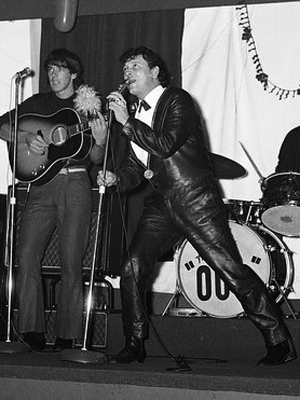 So, my first ever live performance was seeing Gene Vincent and Eddie Cochran in London in April 1960. And, as anyone who has seen Gene perform will bore you to tears with, he was dynamite. I have seen many, many other performers in concert, all the famous rock ‘n’ rollers (except Elvis Presley), but Gene was something else. He was mad! All over Europe, where Gene was the biggest live draw until the blossoming of the Beatles mega-career, other people were having the same revelation as we had. He quickly became a legend. Whether he had a hit record or not (Capitol were particularly ineffective in promoting him record-wise) didn’t mean a bean. we bought the records, of course, and cherished them, but the legend grew until he is now a rock icon. And as my generation grew older, but not much wiser, we played the records and told the stories to our children. This, and the fact that there is a prevailing culture amongst the not-so-young that a good record is a good record whatever the date on it (just look at the booming market in CD re-issues) leads to the continuing acclaim for the main man here in Europe. GENE LIVES. In 1993, She She Little Sheila and I decided to embark on a pilgrimage which did not, for a change, involve camping at high altitude, yaks or dysentery, and so we turned our eyes towards the USA. In July, we flew over to Miami and hence on to savour the many delights of New Orleans, including Tipitina’s, and then made a visit to Memphis to stand in that famous little recording studio at 706 Union Avenue, and take a nostalgic stroll down Beale Street. Moving on to San Diego, we began a leisurely drive up Highway 1 to visit friends in San Jose, and hang out in San Francisco, one of our favourite cities. Following publication of my Gene Vincent Discography, I had been invited whilst in Los Angeles to tour the old studios in the famous Capitol Tower, where Gene Vincent and The Blue Caps recorded a wealth of classic tracks in the late 50s. One sunny morning in August, we drove up to Hollywood from our hotel in the Korean district, and went looking for Gene’s star on the Hollywood Walk Of Fame. This did not take long because it is directly opposite the Capitol Tower, near where we had parked. Mario Lanza’s star is to the north and Russ Morgan (?) to the south. The top of the Tower was not showing its normal Capitol logo as it was cloaked in a huge Beach Boys banner. Going into reception, we were directed to Michael Frondelli’s office. He was the Director of Studio Operations, who had sent us the invitation. We were warmly greeted by Paula Salvatore, the Recording Studio Manager, and chatted for a while about Gene whilst Michael was being found. Paula mentioned that there had been a big function for The Beach Boys in the studios the night before, celebrating their 30th Anniversary. For the occasion, loads of sand had been trucked in and poured on the studio floors to create a “beach party” ambience. I remarked that this could only happen in America and Paula narrowed that to “LA”. She mentioned the possible bio-pic on Gene and asked if I knew anything about it. When Michael arrived, he was also most friendly and helpful. I asked him whether he had had any input into the 6CD Box Set, but he didn’t seem familiar with it, as it would have been put together by the record company archive department. In his office, Michael showed us a large enlargement of one of the famous black and white publicity shots of Gene and The Blue Caps in Studio B, where Gene appears to have no legs because they are hidden by Paul Peek’s and Tommy “Bubba” Facenda’s. There is another large copy of this in the corridor leading to the old studios. This has since been autographed by Johnny Meeks, Paul, Bubba and Dickie Harrell, during their California tour a year or so back. I mentioned that I had always been amused by the hole in Gene’s guitar in the picture, and Michael said that this was for the insertion of a microphone. This seemed unlikely to me as Gene did not play on any of his Capitol recordings. A few months later Dickie Harrell wrote to me saying that he had caused the hole in the guitar by throwing a cherry bomb at Gene during some typical Blue Caps’ horseplay. In his office, Michael also has an original Fender guitar amp as used by Johnny in the pictures. After this discussion, we were given a tour of the old studios by Curt Anderson, who worked in Studio Set Up, a cordial young man who is a fan of the “old music”, as he described it. It was a thrill to stand in Studio B and the control room in which so much great music has been produced. Although the studio has been modified by being knocked through into Studio A, the original wall panelling, as seen in the photographs, is easily recognisable. I asked Curt’s opinion about the missing backing vocal overdubs on “Lonesome Boy”, “You Are The One For Me”, and “I Might Have Known” in the Box Set versions. I had already confirmed with Johnny at Keighley in July, that he and Clifton Simmons “and maybe Grady (Owens)” had “sung that ooh-wah stuff” on the sessions of October ’58, after the “Clapper Boys” Paul and Bubba, had parted company with Gene. Curt’s suggestion was that these recordings would have been done on a three track tape, with lead vocals on one, instrumental backing on the second, and the backing vocals over-dubbed onto the third track of the master. Somehow the third track must have been ignored during copying, transfer or re-mastering for the CDs. Although Curt was an Eddie Cochran fan, he was not aware that Eddie had sung backing vocals on the sessions on 25th to 29th March 1958, and he was gob-smacked that I had seen Gene and Eddie perform in London in April, 1960. After the studios, Curt showed us some original microphones from the ’50s and the old metal stools, still favoured by bass players apparently. Ever helpful, he then took us up to meet the longest-standing studio employee, Senior Recording Production Engineer, Jay Ranellucci, who joined the company on April Fool’s Day, 1957. Jay was present on some Gene Vincent sessions, although as he said, “36 years is a long time”, and his memory of them was not vivid. He did recall Gene pestering Producer Ken Nelson for money, using “some story about hurting his leg in an accident”. Curt had passed on this piece of Capitol Tower folklore earlier. I got the impression that they were not aware that Gene had genuinely been crippled for life in the earlier motorcycle crash. I asked Jay if he still enjoyed the job. “Mostly - except the Rap”. I had been keen to talk to Ken Nelson during the trip, but had been unable to get a contact address. Jay told me that Ken, now in his 80s, was living in Oxnard, a town north of Los Angeles and directly on our route. Not having his phone number, Jay very kindly called directory enquiries there and then and got it for me. During our visit, everyone had spoken warmly and respectfully about having Aaron Neville, another of my musical heroes, in the studios recently to record his Christmas album, Curt describing him as “a national treasure”. We were thrilled a few days later, to find that our friends had got us tickets to see The Neville Brothers playing live near San Jose. But that’s another story. Having voiced our thanks and said our goodbyes, Sheila and I went for a wander along Hollywood Boulevard for a while amongst the hordes of rubber-necking and camcorder-toting tourists. After a Mexican lunch and a quick trawl round Tower Records, we headed out of Los Angeles into the hills to Newhall and the Eternal Valley Memorial Park. Although we arrived after official closing time, a congenial and conducive lady found the location of Gene’s grave for me, and chatted for a while about him. She was only vaguely aware that someone who “had been famous” was buried there, and surprised to hear that he is still remembered in Europe. We found the grave after a short search. It is on a slope facing north towards the busy Highway. The cemetery is well maintained and the stone in good condition, if in questionable taste. There is a musical notation in the inscription of the first two bars of the chorus of “Be-Bop-A-Lula”. I left copies of both editions of my book at the graveside as my small tribute to the great performer, and washed the dust off the stone with the remains of my beer. It seemed an appropriate gesture. Afterwards, we drove into the tiny town of Newhall and drank a bottle of their best bubbly out of plastic cups in a self-service Italian deli whilst I imagined Gene in his decline, driving in to pick up his groceries and booze at the beginning of the ’70s. Back at our hotel, I telephoned Ken Nelson. His wife answered and I was excited when Ken came on the line. Yes, it was Ken Nelson, but no, he had never worked for Capitol Records. Wrong Ken Nelson! That night, we ate dinner in a nearby, popular Korean restaurant where we were the only Caucasian customers. The waitress didn’t speak English and her small brother was hauled in to translate for us. The food was great, complemented by cold Korean beers, but the ambience was transformed by a resident DJ loudly playing such Korean favourites as Led Zeppelin’s “Stairway To Heaven”. The next day, we drove through Oxnard, stopping for lunch, and keeping an eye out for elderly gentlemen with golf clubs, as we set out on the long, spectacular drive northwards on El Camino Real. 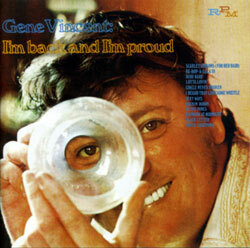 By January 1957, Gene Vincent was a veteran of the rockabilly life. His drag strip ride in six months from humble beginnings to a recording contract with the major Capitol record label leading to the instant world-wide fame brought by the mega-success of his first, self-penned, single Be-Bop-A-Lula (c/w Woman Love, a number considered unsuitable for airplay) had been followed by a gruelling round of touring (mainly open-air Summer Fairs characterised by mobbing induced by his dynamic stage act and the exciting backing from the now legendary Blue Caps). 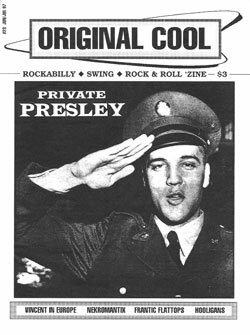 He had conducted eight further recording sessions in Nashville, and had performed on Alan Freed’s radio show and in the Hollywood film The Girl Can’t Help It. A residency at the Sands Hotel, Las Vegas had been terminated early, according to Dickie Harrell, because the band was attracting customers away from the tables. It had all been too much for rhythm guitarist Willie Williams (replaced by Paul Peek), and the great lead guitarist Cliff Gallup, who both returned to the sanity of regular employment at the WCMS radio station in Norfolk VA (where the story had begun with the help of DJ “Sheriff” Tex Davis). Upright bass player Jack Neal quit the music business entirely! Gene was also in legal dispute with L & B Management over his business relationship with Davis, with whom he had by now also parted company. Although his first album Bluejean Bop (also released on 3 EPs) sold well, two further strong single releases (Race With The Devil/Gonna Back Up Baby and Bluejean Bop /Who Slapped John) failed to become major hits in the States (although Bluejean Bop reached #12 in UK charts). Eager as always to get back on the road, Gene started putting together a new Blue Caps line-up. 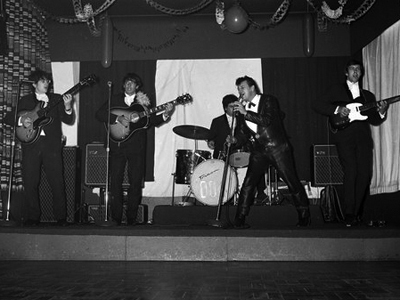 Recalling drummer Dickie “Be Bop” Harrell and Paul Peek (who he switched from rhythm guitar to backing vocals), Gene added teenager Tommy “Bubba” Facenda as second backing vocalist (these two would be later dubbed by Gene as his “Clapper Boys”), and at Paul’s suggestion auditioned the guitarist from his old group Country Earl and the Circle E Ranch Boys, a band that would serve as training school for no less than five Blue Caps. Thus, Johnny Meeks was duly ushered into future legendary guitarist status. Bill Mack was drafted in on electric bass, and the band embarked on a 10 day “Rockabilly Spectacular” tour of Ohio, with Carl Perkins, Roy Orbison and Sanford Clark. Falling out with Bill Mack, Gene replaced him with another of Country Earl’s players, Bobby Lee Jones, and they played up a storm at a 30,000 seater Howard Miller Show in Chicago at the end of April. Being manager-less, Capitol in-house producer Ken Nelson (who had overseen the 35 tracks Gene had recorded in the previous year) put Gene in touch with Ed McLemore in Dallas TX, who already managed Capitol artist Sonny James. McLemore also ran the Big “D” Jamboree, a mostly C & W show similar to the Grand Ole Opry and the Louisiana Hayride, which was broadcast every Saturday night from the Sportatorium on radio station KRLD. By the mid ’50s, the Big “D” had begun to experiment by featuring nascent rock ‘n’ roll acts such as Sid King and the 5-Strings, Carl Perkins and Elvis Presley, a controversial move calculated to attract the lucrative youth audience who increasingly thought country music “square”. McLemore set Gene up with an experienced road manager named Larry Thacker (a man not popular with musicians, Ronnie Dawson describes him as “a vulture…the ultimate…you know, typical old sleazy guy…he was always selling something”(I)), transport for the band, and new stage uniforms for the Blue Caps. He was also provided with a ranch-style house in what was then far north Dallas at 6551 Dyke’s Way, into which he moved his parents and two younger sisters. The Dallas days had begun. 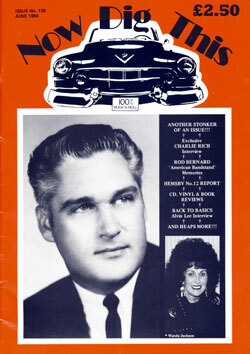 Two further single issues, featuring the original Blue Caps line-up, Crazy Legs/Important Words and B-I-Bickey-Bi Bo Bo Go/Five Days, Five Days again failed to make any significant national impact. 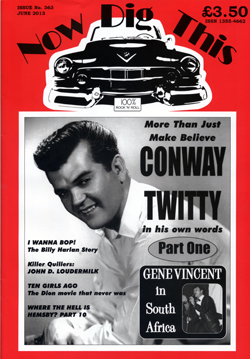 Although there is a long-standing hypothesis that Capitol’s refusal to engage in Payola was the basis of this post Be-Bop-A-Lula hiatus, Gene’s discomfort as interviewee, leading to his reluctance to take on promotional activities with radio DJs, may also have been a contributory factor in inhibiting airplay, essential to the success of new releases. Earlier, local oilman-turned-music entrepreneur Tom Fleeger, who had been very impressed by Be-Bop-A-Lula, had come across a song by Dallas songwriter Bernice Bedwell that he was sure would be perfect material for Gene. According to Tom, he tracked down Gene at home in Portsmouth VA, and played him a demo over the telephone of Lotta Lovin’ cut at the Sellers Studios in Dallas by Norton Johnson (included on this CD), with Gene responding “Man, that’s a smash hit!”(I). Gene told Tom that he and The Blue Caps were due in Dallas two weeks later to play the Sportatorium, and assured him that they would get together with him. When they arrived, Fleeger carted them across town for a makeshift demo session of home recordings, made at Fleeger’s mother Jan’s apartment at 5921 Sherry Lane, the results of which are included here in their entirety. Two songs written by Bedwell, Lotta Lovin’ and In My Dreams, as well as Mary Tarver’s Nervous (later to be a regional hit for Gene Summers), were amongst those Fleeger had Gene rehearse and record on his newly purchased home reel-to-reel recorder. Gene’s instinctive ear calls a halt to the second attempt at Lotta Lovin’ (”Somebody’s off there, man”), and his authority over proceedings is subtly obvious throughout. Seemingly happy with the Bedwell compositions (Jan Fleeger can be heard exclaiming “That’s good!” in the background), Gene is uncomfortable with Nervous, and, after a couple of attempts to get a feel for the lyrics, abandons it. Coincidentally, Gene also failed to successfully record another Gene Summers record School Of Rock and Roll at another home recording session in Ronny Weiser’s LA apartment in 1971. Also included here is a recording of Gene whistling a tune listed on the tape box as On My Mind, a song that has not appeared on any other Gene Vincent release. Fleeger recalls “I think we had a break and so Gene…just thought he wanted to show everybody he could whistle”(I). This historic tape was to turn up decades later at a garage sale held by Tom Fleeger’s ex-wife, when it was bought in a box of JAN singles and a number of other reel-to-reel tapes. Within a day or so, Fleeger made arrangements for a proper recording session at Sellers Studios and Gene went in with the full band and cut the demo of In My Dreams featured in this compilation, the first studio recording by the new Blue Caps. Another recording of Lotta Lovin’ included here is claimed by Fleeger to be a studio demo, but it sounds remarkably like an excerpt from the home tape with added echo. On 11th May, the band played the Big “D” Jamboree (tickets 30 cents and 60 cents) and shortly afterwards, Tom Fleeger, Bernice Bedwell and Gene met Ed McLemore and played him Gene’s demo of Lotta Lovin’. Ed was suitably impressed and demanded that Fleeger relinquish his entire share of the publishing to his Big “D” Music publishing company. Fleeger and Bedwell refused and left. Undeterred, Tom waited for Gene to emerge from the meeting and persuaded him to play the song to Ken Nelson at his forthcoming Capitol sessions. In June, the band drove to Hollywood to cut their first recordings at the famous Capitol Tower studios, with Buck Owens sitting in on acoustic rhythm guitar. On the 19th, at the 9th take, they recorded the master of Lotta Lovin’ that was to secure Gene’s second major hit record, peaking a month later at #13 in the Billboard charts. Fleeger claims that McLemore was so incensed at the success of this song, published by Fleeger’s Song Productions Inc, that he attempted to blackball Fleeger’s independent record company JAN by turning his distributors against him, which lead to the relative failure of Gene Summers’ Nervous and eventually to the demise of the JAN label itself. The success of Lotta Lovin’ was just the career boost needed, and Gene and The Blue Caps were once more embroiled in big rock ‘n’ roll package tours. In September, they made their only excursion abroad, joining a hugely successful tour of Hawaii, Fiji and Australia in the company of Little Richard and Eddie Cochran (who Gene had met on the set of The Girl Can’t Help It and would become very close to). On their return to the States in late October, the band was as hot as ever and caused tremendous scenes wherever they performed. In one incident at a 32,000 seater in Chicago (where Ken Nelson was to present them with a gold record for Be-Bop-A-Lula), a riot ensued where reportedly even Nelson had his clothes torn off by over-enthusiastic fans. During a tour of the west coast, Gene met a young divorcee Darlene Hicks, was quickly smitten, and they became “an item”. Capitol rush-released Dance To The Bop in November, Gene performed the song live on the Ed Sullivan TV show (now with Max Lipscomb on rhythm guitar)(Fleeger claims that “Ed McLemore was so mad about Lotta Lovin’…being played on every radio station…told Gene…he’d have to sing Dance To The Bop”(I)), and the single duly peaked at #23 in the Billboard charts. For further recordings at the Capitol Tower, Gene decided to re-equip the group, and Leo Fender provided the band with three new Fender Stratocasters, a bass guitar and the latest Fender 50 watt speaker/amp combo. The sessions produced the classic rocker Baby Blue. Gene returned to Dallas for a Christmas respite, taking Darlene and her small daughter Debbie with him. 1958 was to be a year of big changes. In December, Paul Peek and Tommy Facenda had left to pursue solo careers, and Max Lipscomb decided to return to school. Gene, a big Jerry Lee Lewis fan, wanted to add piano to his line-up, so Country Earl promptly lost the services of Clifton Simmons. Ed McLemore’s booking agent Ed Watt (who didn’t get on with Gene but readily admits “he could sing…he was a Showman…he was great…just super great”(I)), contacted Dallas songwriter Grady Owen (whose demo of his I Don’t Feel Like Rockin’ Tonight is included here for flavour, he was later to pen Lovely Loretta for Gene) and offered him the job of Blue Caps’ rhythm guitarist. Within a few weeks of touring, Dickie Harrell, who had become serious about Tommy Facenda’ s sister back in Portsmouth VA, quit the band. This was less than convenient, as McLemore had secured a part for Gene and the band in the forthcoming teen movie Hot Rod Gang, and more Capitol Towers sessions were booked for March. Gene was able to persuade Paul and Tommy to return to fulfil these engagements, but Dickie refused. 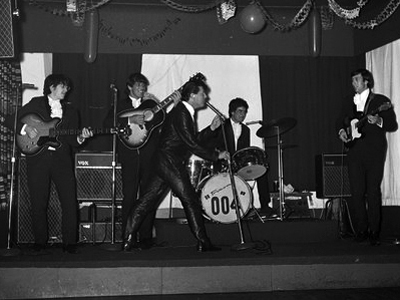 Whilst playing a gig in Fort Worth, using Dude Kahn (Sonny James’ drummer) as fill-in, Gene caught the opening high-school group’s act and was so impressed by 15 year-old drummer Juvey Gomez that he sent Larry Thacker to ask him to join the Caps. After making arrangements with Juvey’s business-like mother and his teachers that would enable his continuing education, Juvey came on board. The band put up in a Dallas motel and rehearsed for a few days at the house in Dyke’s Way, which Gene’s parents had vacated by now (Darlene and Debbie remaining in residence), and then drove out to Hollywood. The Capitol Tower sessions of March 1958 are the most legendary of Gene’s recording career. Joined unofficially by an un-credited Eddie Cochran on bass backing vocals, on 25th to 29th March (except the 28th, when he was at Goldstar Studios cutting Summertime Blues) 16 superb masters were produced. Amongst these were great rocking tracks like Dance In The Street and Lovely Loretta (to be featured in the oncoming movie) and the classic Git It (the original, surprisingly well-formed demo of which by writer Bob Kelly is also included in this CD), Gene’s lyrically altered version of Bob’s Somebody Help Me (the original demo by Kelly is also included here for comparison), and the affecting gentle ballad Peace Of Mind . On 30th March, they went into American-International Film Studio to film their performances in the movie, to be released on 2nd July. It double-billed with High School Hellcats. Gene and the band’s (mimed) performances of Dance In The Street and Baby Blue in the film were particularly striking. The movie was not. After the filming, Juvey returned to school to complete his exams whilst the band took a break, and then re-joined them for a riotous West Coast tour (”It was an experiment to see how his music would actually appeal to the black people…so they had to hire a black sax player…Hayworth…a good player”(I)). This proved enough for the young drummer (”I mean, these guys are crazy…they’re acting like a bunch of kids…I didn’t like that part of it”(I)), and he quit to join Buddy Knox and The Rhythm Orchids, a more sedate outfit. Gene returned to Dallas to re-group. It was possibly during this period that some more of the tracks included here were recorded at the Sellers Studios. The spine-tingling solo rendition of My Love (later re-titled In Love Again) that opens this set probably has Gene accompanying himself on acoustic guitar. 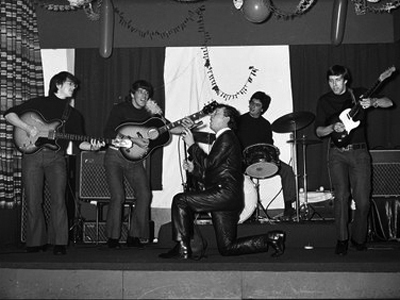 Surprisingly, although penned by Johnny Meeks, the demo of Hey Mama (later to be re-titled Say Mama and become one of Gene most popular songs), has Texan “Blond Bomber” Ronnie Dawson on guitar (”I was there doing something…Gene just came in and…said ‘You want to play with me…I got this little song I want to demo?’…It was just like it sounded, it was a short-sleeve thing”(I)). It seems that Johnny was simply not around at the time Gene was hot to cut the track. He was back, however, for a further session where two cuts of the beautiful ballad The Night Is So Lonely, the latter with backing vocals by Johnny, Cliff and possibly Grady, were laid down. Two other tracks, the engaging country-styled Lonesome Boy and Johnny Carroll’s Lady Bug may possibly have also been cut at this session. Gene now suffered another blow. With a 40 day tour of Canada lined up, Johnny Meeks and Bobby Jones decided to return to Greenville NC. Auditions were held at Ed Watts’ office, and local player Howard Reed was hired for the lead guitar job. The band now consisted of Reed, Cliff Simmons, Grady Owen (on bass), a restored Max Lipscomb on rhythm guitar, and Dude Kahn back on drums. Kahn only lasted a few dates (”we played one time at a beautiful concert hall…we had this gorgeous full-sized grand piano…and one of the guys went sliding across the piano and his belt buckle tore the finish…I just didn’t like stuff like that”(I)), and ex-Elvis Presley drummer D J Fontana was flown in. 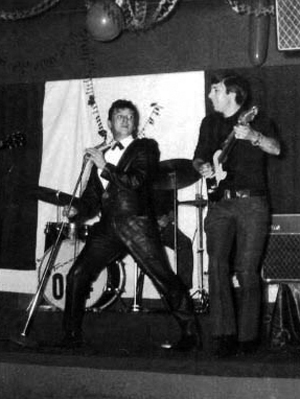 During the tour, Gene decided he wanted to re-introduce the Clapper Boys into the act, so Grady and Max moved to this rôle and Bill Mack came back on bass guitar. After the usual riotous on and off stage carryings on, at the end of the tour the group played a few gigs in the USA and then disbanded. Gene’s luck took an upswing in September, however, when Johnny Meeks called and, refreshed by his vacation from the road life, asked to re-join. Country Earl now lost his drummer Clyde Pennington. It seems that Country Earl never resented losing musicians, but was rather proud to be providing them to a “big name”. Grady Owen came back on bass, and after more touring, the band checked into the Capitol Tower for the final time. Supplemented on some tracks by saxophonists Jackie Kelso, Alexander Nelson, Gil Bernal and Herbie Stewart, Gene made his last recordings with The Blue Caps. The first song recorded was Lonesome Boy. The sessions produced a jaunty rendition of Who’s Pushing Your Swing (the original demo by Darrell Glenn is included here), the ballads The Night Is So Lonely and In Love Again, and the classic rocker Say Mama, a number Gene would continue to perform for the rest of his short life. The final recording by the band was the self-penned Vincent’s Blues.